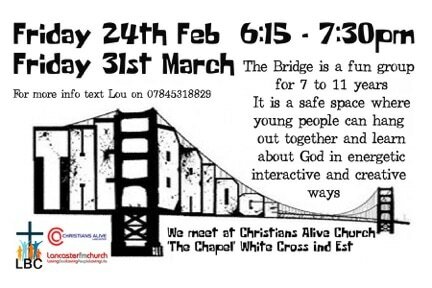 The Bridge is re-launching! An inter-church group for 7-11 year olds: run by Christians Alive, Lancaster Baptist Church, and Lancaster Free Methodist Church. It’s a monthly opportunity for lots of fun, games, and focus on God - feeding into the Stream youth group. Sometimes "graduating'' up to a youth group can be a bit scary, so this group is to help our children to build community and connections before they go to High School - encouraging them in their faith, and also sharing their love for Jesus with their friends.